Designed to offer intuitive multimedia enjoyment to PC users, ASUS has released the 23.6” ET2410 series all-in-one PC which comes loaded with an enhanced version of SonicMaster and DTS Surround Sensation UltraPC™ technologies, as well as an optional external subwoofer to ensure crystal-clear, powerful and spacious PC audio. Featuring a slim design with a profile of only 6cm, it rests on an aluminum pedestal that provides stability and easy cable management. Nestled within its profile are the latest computing features that include a multi-touch display, side panel USB 3.0 ports, an HDMI input and the touch-optimized ASUS Cinema software. ASUS utilizes a host of innovative solutions to deliver crystal-clear, immersive audio that is perfect for both music and movies. Engineered by audio experts, SonicMaster technology utilizes a fine-tuned digital signal processor to deliver an expanded sound range, improved fidelity and more distinct vocals. DTS Surround Sensation UltraPC™ further enhances audio enjoyment by reproducing surround sound with twice the impact of other technologies. An optional external subwoofer with a 580cc resonance chamber dedicated for low-range frequency audio signals guarantees rich bass response - unheard of in traditional all-in-one PCs. While acoustically pleasing, the ET2410 is also visually pleasing. All-in-One PCs are already fairly compact, but ASUS went even further to reduce the ET2410’s desktop footprint. At a mere 6cm deep, all ET2410 models feature a gorgeous 23.6” LED backlit display, while premium models come with a 2nd generation Intel® Core™ processor, NVIDIA® GT540M graphics card with 1GB of dedicated video memory, 1TB HDD, Blu-ray combo drive, built-in TV tuner, a massive 8GB of DDR3 memory and more — all inside an elegantly designed enclosure. To ensure maximum stability, it rests on a pedestal made of durable, high quality aluminum. The ET2410 Series comes with a multitude of convenient features, making it easier and more comfortable to surf the web, browse through movies and music or edit photos. Acting like a giant tablet, the touchscreen models feature optical multi-touch controls in addition to the standard keyboard/mouse inputs. On the side are two USB 3.0 ports and a 3-in-1 card reader, while an HDMI input port turns the ET2410 into a brilliant 23.6” display for gaming consoles or a second monitor. 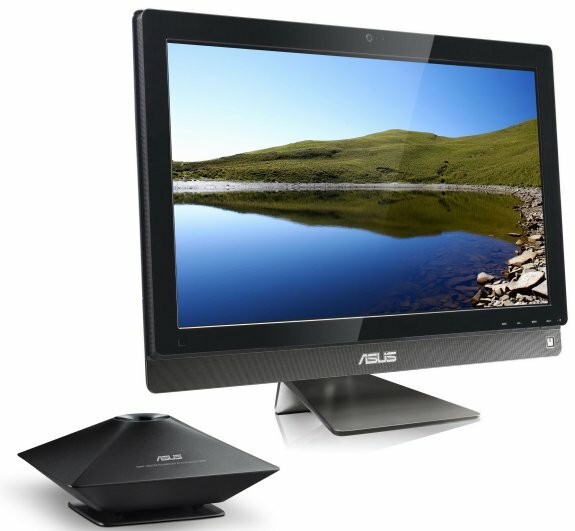 It’s compatibility with VESA mount allows the slim all-in-one PC to be placed almost anywhere. ET2410 comes bundled with the touch-optimized ASUS Cinema software that makes browsing through movies, music and photos easier than ever.